The January to April 2019 Newsletter is now available! Skating is FREE for Community Members sporting skate tags at our community ice rink 10941 161St. Use at your own risk, no attendant on site. Open daily from 8am to 11pm. Lights are on timers, just press the red button on the wall of building to turn them on. 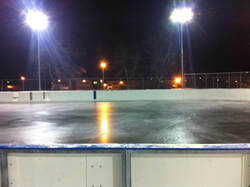 Please note rink will be closed when being flooded or when temperature is +0 or above. Where: Mayfield Community Hall 10941 161 St. Details: All residents of Mayfield are encouraged to come and participate. Board members will be elected and there will be lots of chances to meet new people from our community. What: Join us for a pancake breakfast as we celebrate the holidays. When: Sunday December 9, 2018 from 10:00am to 12:00pm. Details: Free for all Mayfield Community Members. Memberships can be purchased at the door. The City of Edmonton Park Rangers - Wildlife Citizen Services, has be contacted by a couple of citizens in our area regarding coyote sightings. They have received multiple coyote sightings through their complaint line and they wanted to provide Mayfield Community with some information on coyotes. Please click here for an information pamphlet on coyotes. The September to December 2018 Newsletter is now available! The May to August 2018 Newsletter is now available! Edmonton Public Schools is hosting meetings in April and May to continue our conversation about creating great learning spaces for students at Brightview, Britannia, Mayfield and Youngstown schools. In 2016 and 2017, we held several meetings to talk to parents and the community about potential concepts for the area, but the feedback we received did not lead us to a firm decision. If people can’t attend a meeting, they can view the presentation online (after April 13) and provide their input through our online survey at spaceforstudents.epsb.ca from April 3-May 11. Please note due to inclement weather our large skating rink is now CLOSED. . The January to April 2018 Newsletter is now available! The September to December 2017 Newsletter ﻿is now available! The May to August 2017 Newsletter is now available! What: Mayfield has bingo fundraisers for the Mayfield Community every month. We are always looking for volunteers to work the events; 14 volunteers are needed per Bingo for all dates. 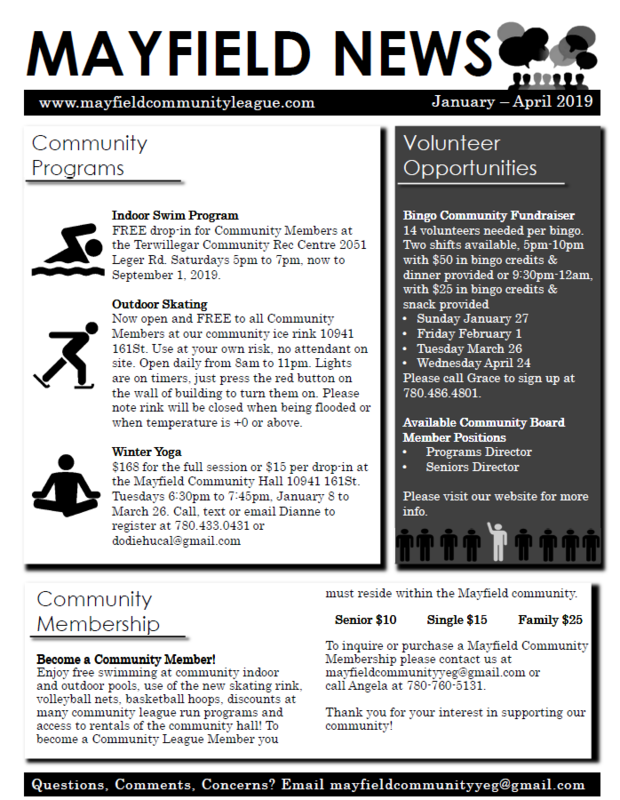 All volunteers who are Mayfield Community League Members will receive a credit voucher to be used on any programming of their choice in the city. There are two shifts are available, the early shift is from 5 pm to 10 pm which provides dinner and $50 in Bingo Credit. The late shift is from 9:30 pm to midnight and provides a snack and $25 in Bingo Credit. Where: Castledowns Bingo Hall 12222 137 Ave. If you are interested in volunteering, please call Grace at 780-486-4801 or fill out the form below. Thank you for your interest in supporting our community! Join us for some refreshments and to vote in your Community League Board Members. All residents of Mayfield are encouraged to come and participate. Congratulations to Jackson Collins for getting nominated as a Mayfield Community Snow Angel! You have made a difference in our community by shoveling your own sidewalks, and by graciously lending a hand to neighbours who needed help with theirs. Thank You!